Pepi was the horse who started Rainbow Horses. He didn’t enjoy being ridden by a lot of different people at his previous home. When he first arrived he was quite nervous and had a few interesting habits! In the 10 years he's been part of Rainbow Horses he’s become a real gentleman. He is calm and reliable and he works really well with children on the autism spectrum. Tornado used to play polocrosse but he is a laid-back character and didn’t have the competitive spirit needed, so he has come to us for a quieter life! He is a little nervous in the field but if you are calm and patient he will come and say hello. He is a lovely quiet horse for riding, although he is always looking for the chance to grab a quick mouthful from a passing hedge or tasty clump of grass! Pepi and Tornado are both Argentinian Criollos. They were born in the wild in Argentina and caught and trained by the Gauchos at about 3 years old. Pepi and Tornado were used by the Gauchos for cattle driving until they were about 7 years old. They were then imported into the UK and initially went to the New Forest to be used for Western riding holidays. George is our Shetland pony. He is popular with children but we have to watch out that he doesn't get too bossy as he is a typical Shetland and not scared of anything. We are looking forward to teaching him to play football with a physio ball! Penny is a very sweet little pony. She is an 11 year old New Forest cross: she was born wild like Pepi and Tornado, and, like them, she has been branded. She came to us from Tricia Day of Equine Assisted Qualifications (www.equineassistedqualifications.com) and we are so happy to have her. She makes sure that the herd behave themselves and gets on with everyone. Penny is so friendly and gentle she is perfect for working with the children. She also enjoys tipping over the wheelbarrow! 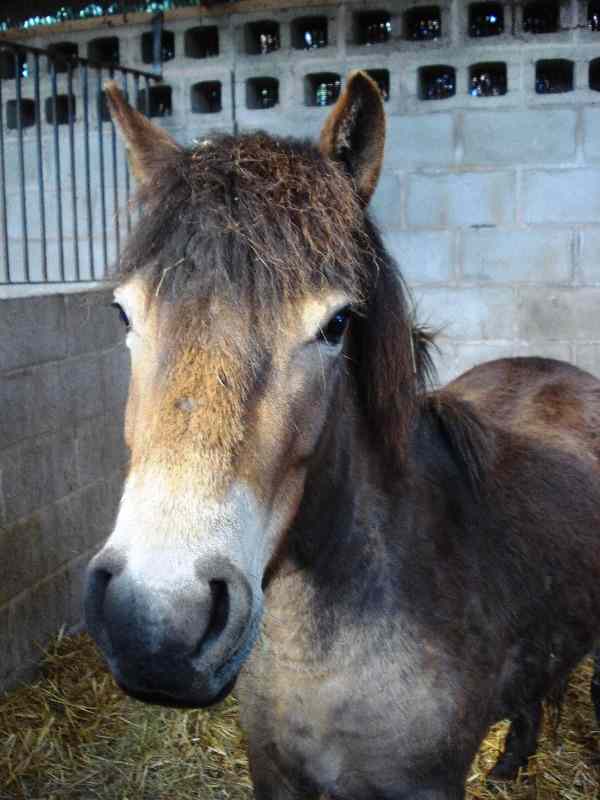 Hazel is an Exmoor pony from the Anchor herd. She has several large brands on her from her time as a wild pony. She was destined for the meat market before we rescued her. She is still very wary of people but we can now put a halter on her and lead her. She is very interested in children and will come for a sniff in the field if you are calm and patient! Paddy is our heavyweight Dales pony for carrying the older children. He is a big softie and likes working in the round pen. He was at a riding school but preferred to be on a leading rein so is perfect for Rainbow Horses! George was his first best friend and Flick now follows him everywhere. 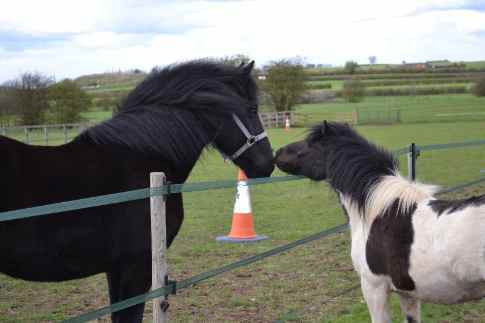 Flick was a much-loved pony whose owner outgrew him. He is a lovely little chap who is a bit anxious at times but works well with small children as he is very sensitive. He is a Welsh pony and looks like a young colt although he is nearly 20 years old! Zion is probably a Criollo/Thoroughbred cross and is from Argentina too. He is an ex polo pony so he has been through quite a lot in his past. He is about 30 years old and has come to us for his retirement. He has a quiet and calm personality and often comes to say hello to the children although he can be a bit wary of adults due to his history.